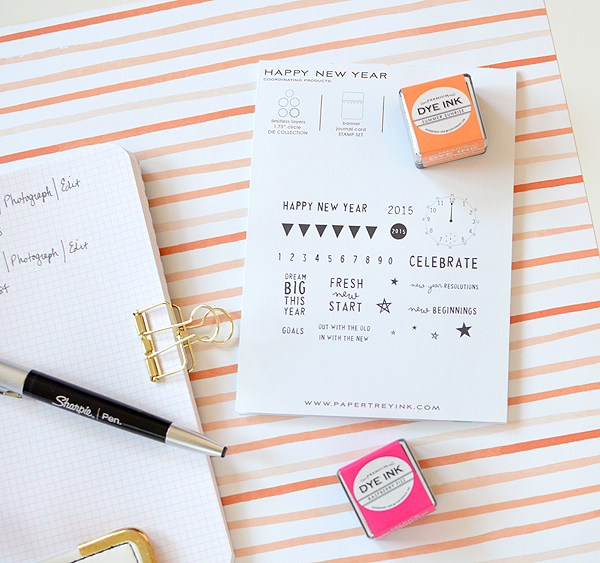 Officially, this is my first blog post of 2016, as well as my first Papertrey Ink Moments Inked post. I've spent the majority of January trying to get myself organized and in a new frame of mind. I went into 2015 blazing! I was gonna do this, I was gonna do that, I signed up for all kinds of classes, accepted positions on several design teams, took on every opportunity that came my way, and I was feeling awesome for about 4 months. Then I got burned out and I honestly don't think I ever fully recovered. December was a whirlwind and I had another mini-burnout over Christmas break which led to a not-so-nice lead-in for the new year. So it caused me to stop and put a lot of thought in how I want to approach 2016. It's going to be a whole lot different. I've turned to my PTI Moments Inked Planner System to help with this. I'm using both the binder and the spiral editions and I've thought long and hard about how I will utilize them to keep me organized, present, and sane. This is not a fancy post and I don't have a bunch of super-awesome tips and tricks for you today. 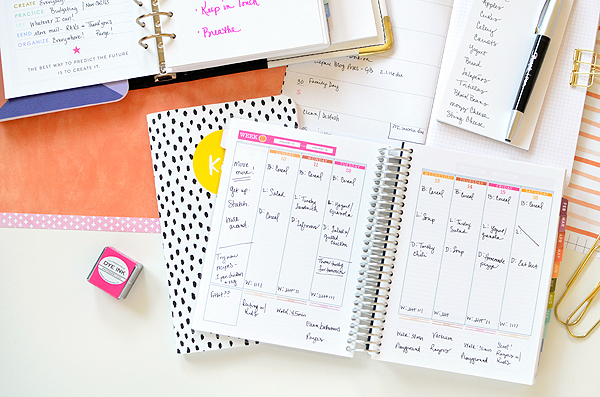 What I'm presenting you with is an honest, bare-naked look at my planners and my stress-free approach to avoid burning out. The first thing I did was try to envision the year I wanted to have in comparison with the year I just lived. I do not want to re-live 2015 and be a hurricane of disorganization, stress, "I'm too busy" and listening to myself tell my children I can't play with them because I have work to do. It's true that sometimes I am too busy and sometimes I do have work to do, but believe me when I tell you that I uttered those phrases way too often last year and the stress and the guilt that ensued is just not worth the reward. I thought it through and brainstormed a few ways to stream-line work--both house and creative--in order to make more time for my family and for myself. I put the 'new year resolutions' stamp from the Happy New Year set to use on the first page of my binder planner. I did not set big, specific resolutions or goals this year, like 'write a book' or 'travel to Australia' or 'complete a marathon'. I chose more mantra-like resolutions that will, I'm hoping, create a mindset shift and a calmer pace of life. Slow down. Be kind. Be brave. Stop procrastinating. Keep in touch. Breathe. I'd like to live that way all year and if need be, I'll write down these same 6 mantras on the tab page of each month. I'm not sure which will be harder to do, though--be brave or stop procrastinating! Next to my resolutions, I filled out the goals page. I filled it out mostly with my business/creative career in mind, but again, I tried to concentrate on areas that would improve my outlook on life and the way I want to enjoy it. For instance, "GO... & mingle whenever possible" is less about having a tremendous social life and more about trying connect with good, like-minded people. Being social is extremely difficult for me but as my kids get older and start making friends and get involved in extra-curricular activities, I, in turn, have to meet new people to ensure they get the most out of each new experience. As a result, I'm spending more time with the kids while we participate in these activities, they're having more fun than they would be sitting at home, and I've even made a few new friends in the process. And if I want my business to grow, I have to step outside my comfort zone and do things I never thought I could do. I attended CHA (Craft & Hobby Association convention) earlier this month and while I had sort of wanted to go in years past, it always petrified me to do it. But an opportunity arose that I couldn't turn down, so I went. The experience was nothing but positive and uplifting! I met so many sweet and genuinely nice women and it ended up being an amazing time. Not to mention, I actually felt proud of myself for doing it instead of the disappointment and shame I would have endured for backing out (because honestly, I almost flaked at the last minute). I'm looking for a better quality of life in 2016. I don't expect that, by making a few notes and putting a few decorations in my planner, I'll get it. But I do intend to use the planners as tools for reminding me of what I'd like to achieve. 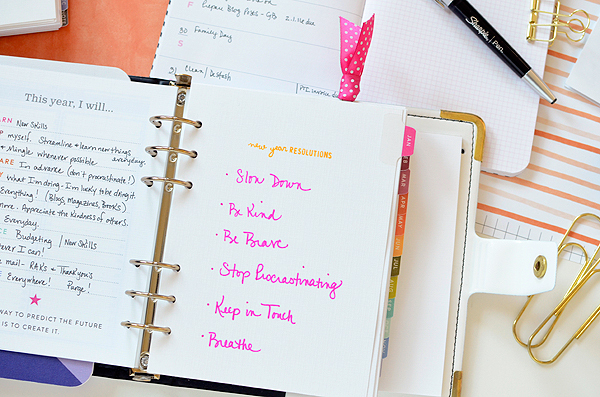 That's why I've turned my MI spiral planner into a Health & Wellness tracker. In the 2015 edition, there were daily pages with sections to encourage us to be thankful, stay hydrated, and track our fitness and meals. They've taken them out of the 2016 versions and I honestly don't mind as it makes a slimmer, more manageable book. Especially if I'm on the go, the binder version as it is is the perfect size to carry around in my bag and I don't need to have all the extra bulk of my gratitude and water intake when I'm doing errands anyhow. So I like doing it this way. I can still keep track of those things in my spiral and leave it behind when I leave the house. For the time being, I'm using the weekly pages to loosely jot down what I ate for the day, water consumption, and fitness. Okay, I'm not one for frequenting a gym or running 5 miles a day, but I try for some kind of activity everyday. If it's a vigorous 30 minute walk or extreme vacuuming, I'll take it! 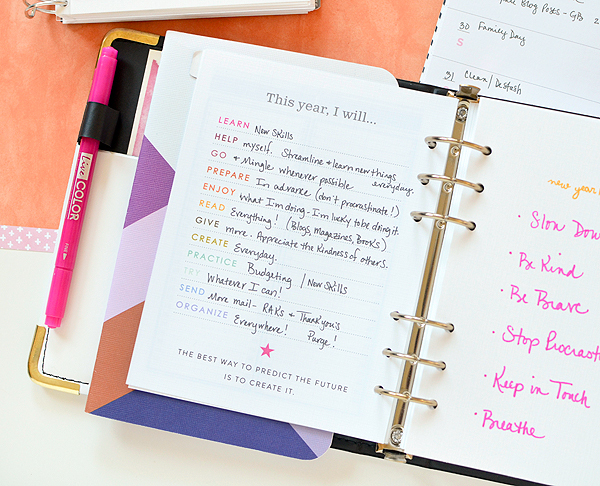 On the goals page for this planner, I'm focusing on self-care and a healthier, happier lifestyle for my family. Eating better, moving more, thinking positively, and getting rid of the clutter that has been piling up everywhere for the last year because I'm "too busy" to take care of it. (I think I'll start by purging that phrase from my vocabulary.) Organization is a big key here. You have no idea how much time I've wasted looking for something that is buried under a tall stack of junk. So I started small here, making a pocket with the MI Pocket Page Die to hold coupons, grocery lists, new recipes, and any small papers having to do with the health and wellness areas of our lives. Thanks for stopping by today! You can find all of these supplies at papertreyink.com. Looks awesome and SO thrilled to have met you at CHA!!!!! Thanks, Amy! And yes! I was so excited to meet you, too! 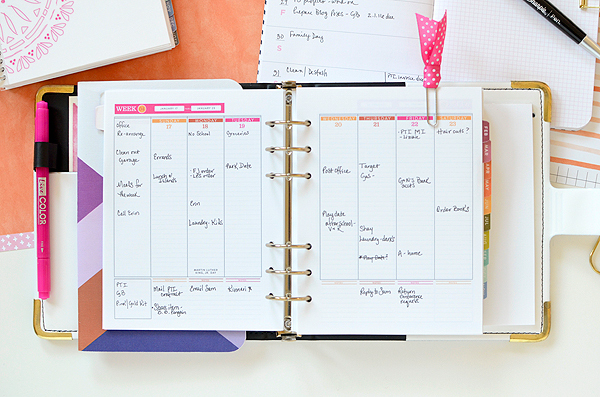 I'm glad you focused on how you plan to use your planners rather than decorating them. While I enjoy seeing how others decorate their planners, I use my planners for organization rather than a creative outlet. Wishing you the best 2016! 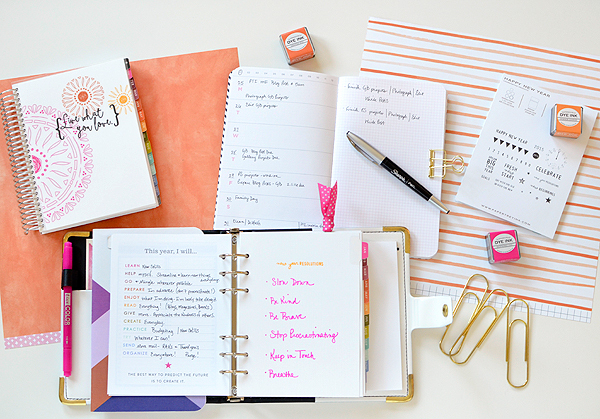 I love to see some good ideas for embellishing planners, but I think that, for me too, organization is my planner's main purpose. That's not to say some creativity won't make its way in there down the road, but to start, I'm focusing on what's easy to do and what keeps me on this calmer path I'm walking. Thanks for your kind words and hoping your 2016 is fantastic and well-organized, Cammie! Thanks for your honest & real-life post! I'm in a similar boat as you & am praying that 2016 is a wonderful, healthy, productive, and satisfying year for you! Great post Rebecca! Thank you. Dear Rebecca, I love this post and your honesty in writing it. 2015 for me was a whirlwind- diagnosed with breast cancer, having yo resign a much prayed for job, traveling regularly to another state for treatment, missing games, grown children events, but all at the same time becoming the person I prayed to be ( and hopefully still becoming) - the person God designed me to be. Working on so much mentally, spiritually, physically very slow and one of my biggest challenges. I ordered a binder planner this year, planning to use it decorated or not. That almost kept me from buying one, but the quality of the whole thing sold me on this system, especially the paper! 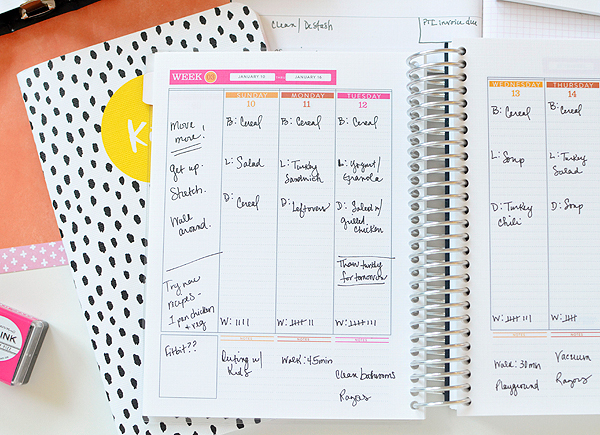 I love the idea of a second planner for health and wellness. I will be upholding you in prayer this year and may He add His blessings and care to your year in every aspect. Great post and a good insight for all of us. What is the paper in the background of your photos? The stripes are so beautiful. Hi Nancy, thank you! The paper is called 'Taken' and it's from the Amy Tangerine line, Finders Keepers. I love it, too! I enjoyed your post. I love decorated pages but my diary is pure organisation! I have creative play in a memory planner. Thanks for sharing your personal story and focus on balance in your life. Thank you, Manda! I'm definitely working on balance right now and hoping this plan to find it and maintain it is going to work! Thanks so much for your honesty, Rebecca! I will be praying for your success! 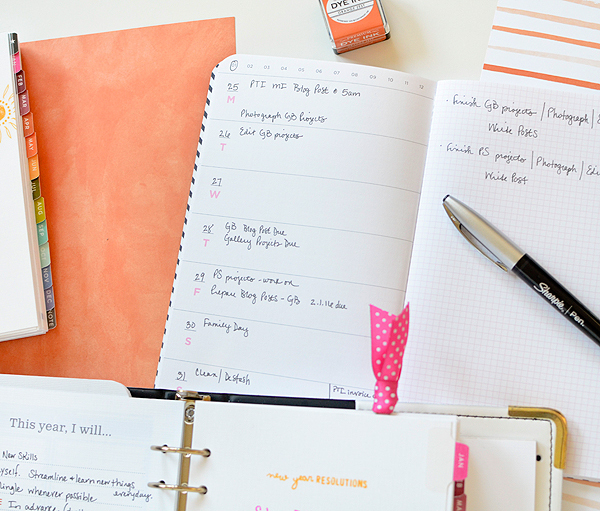 I love the idea of having two planners but never thought about keeping one at home. I totally know what you mean about the procrastination and I've decided for me to be successful at anything, to tackle only three small goals every month to keep the procrastination at bay. It's working so far! :) I'm definitely looking forward to your creations during the year and seeing you grow! Thanks, Ruby! 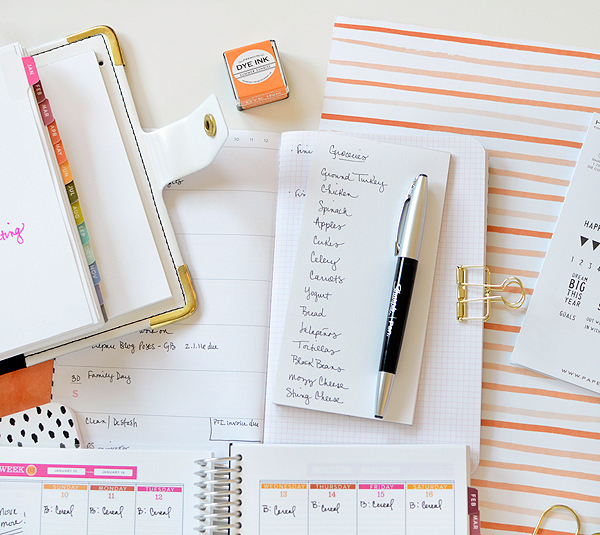 If I had the time and the skills for major planner decorating, I'd do it, but then again, I think I'd get really overwhelmed looking at a page completely covered with writing, stamps, and stickers! I'm with you on efficiency! I've been seeing a lot of folks with the bullet journaling and I think you're onto something good there. 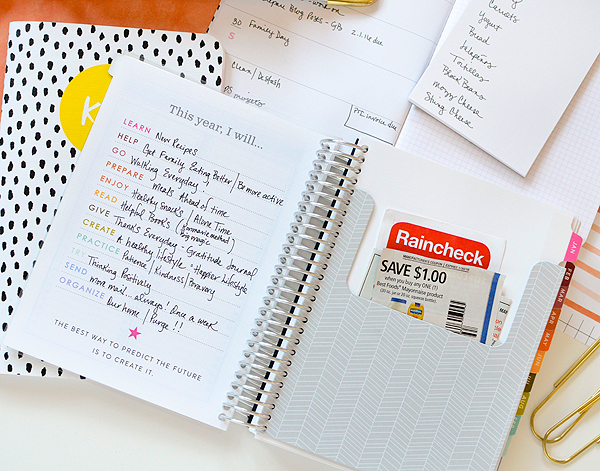 It seems pretty straightforward and not overly time-consuming, which is always my goal when it comes to my own planner.